Small house, 34 sq. 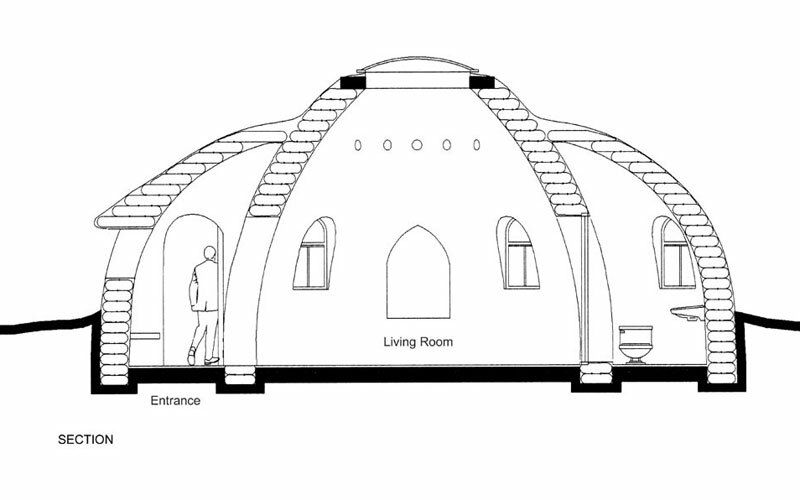 m., five rooms a dome with 4 large apses can upgrade emergency shelter into long-term home. Sandbag Shelters, Ahwaz, Iran. Additional prototypes. Sandbag Shelters, Ahwaz, Iran. Upgraded shelter, section II Niches were not built at Baninajar Camp. Sandbag Shelters, Ahwaz, Iran. 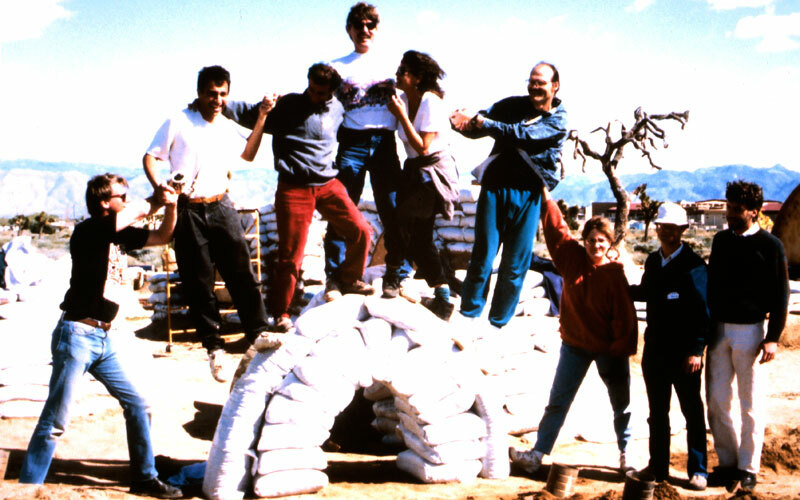 Emergency shelters, UN village, Cal-Earth Institute. Additional prototypes. Sandbag Shelters, Ahwaz, Iran. 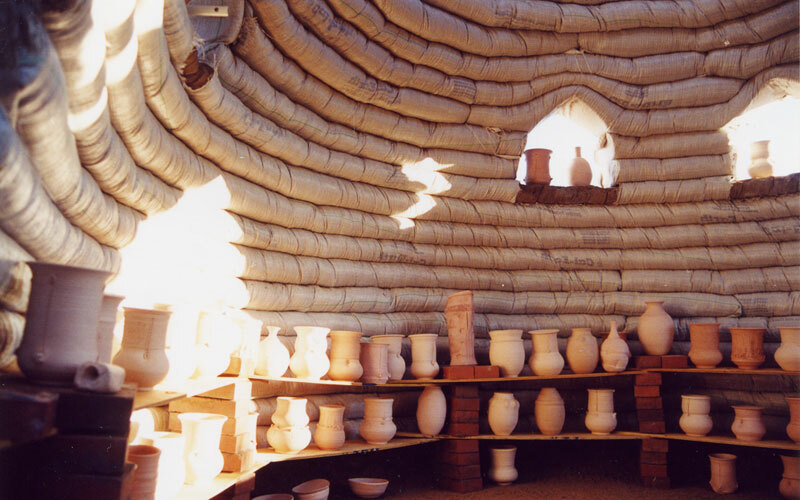 Sandbag Shelter Prototypes, Sandbag Shelters, Ahwaz, Iran. Upgraded shelter, section I Niches were not built at Baninajar Camp. Sandbag Shelters, Ahwaz, Iran. Upgraded shelter, floor plan Niches were not built at Baninajar Camp. Sandbag Shelters, Ahwaz, Iran. 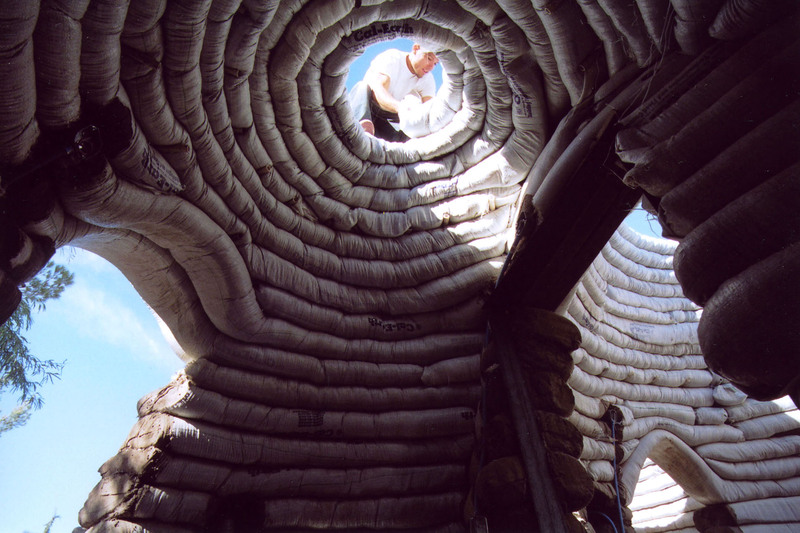 Clusters of sandbag shelters can allow refugees to reconstruct their own social & cultural environments. Sandbag Shelters, Ahwaz, Iran. 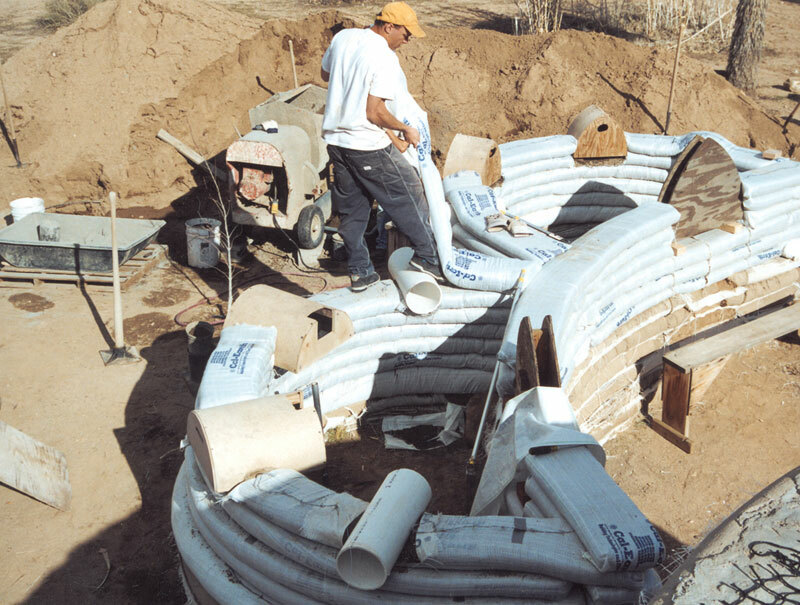 Technical development continues at Cal-Earth Institute post project for emergency shelters using long sandbag coils (Superadobe), barbed wire, and clustering spaces. Additional prototypes. Sandbag Shelters, Ahwaz, Iran. 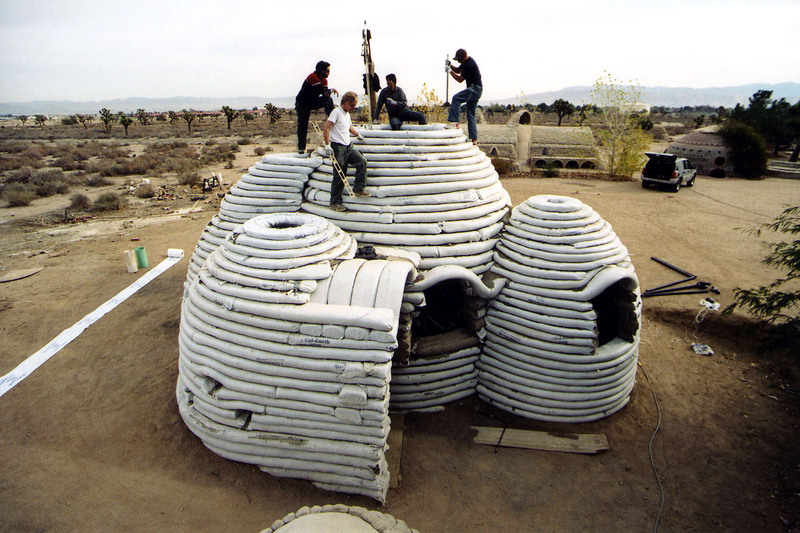 Sandbag architecture students learning the essence of building with earth, Cal Earth Institute. Pre project phase. Sandbag Shelters, Ahwaz, Iran. 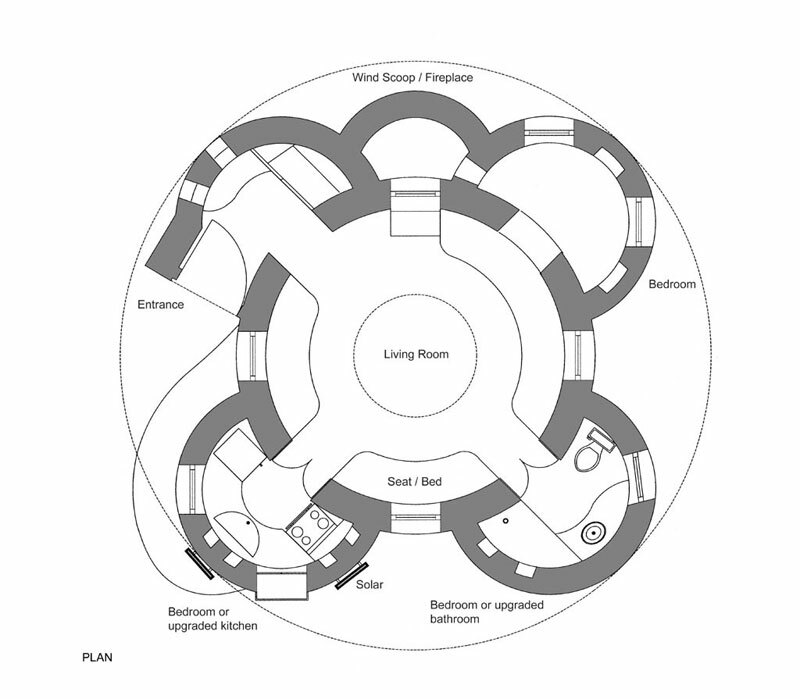 Emergency housing for refugees, sponsored by UN agencies and designed by an architect at the Cal-Earth Institute. 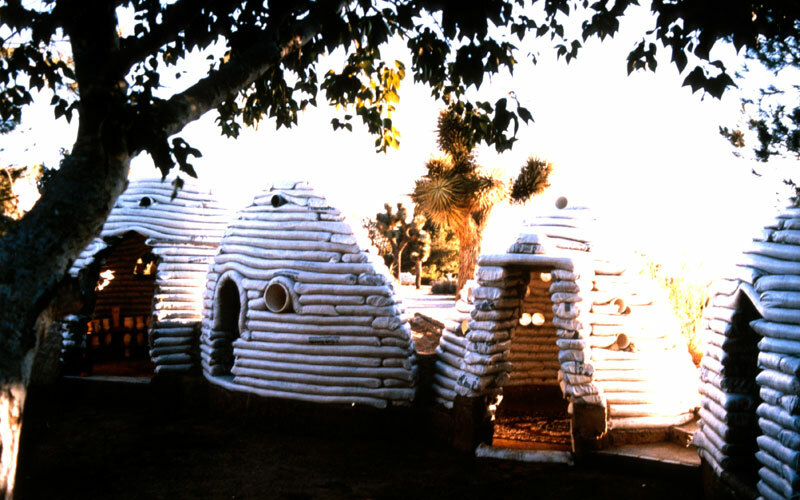 The arch-shaped adobe houses are seismically safe, impervious to weather conditions, and built using war materials. 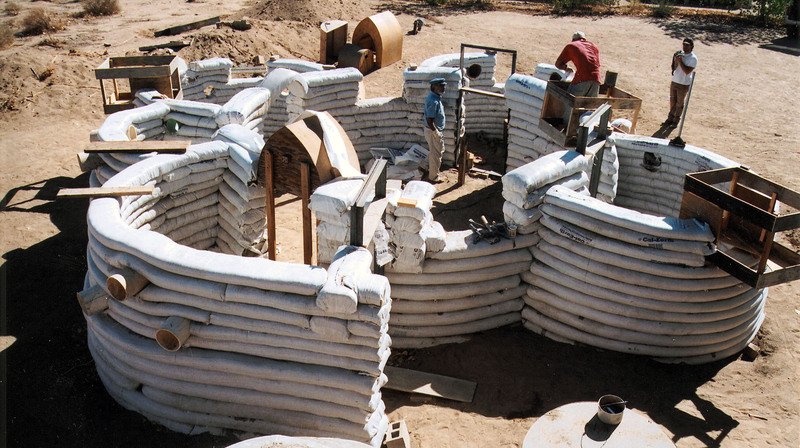 Sandbags are filled with on-site earth, arranged in layers and lined with strands of barbed wire to act as mortar. Stabilizers like cement, lime and asphalt emulsion are added to the structures, which are fired", turning the mud into a ceramic-like material. 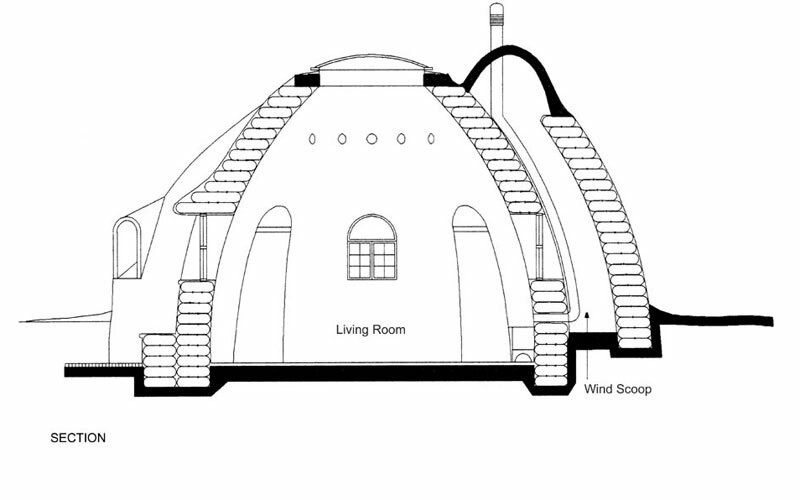 Ì_They measure 14 square metres each and, significantly, cost only $4 to construct."